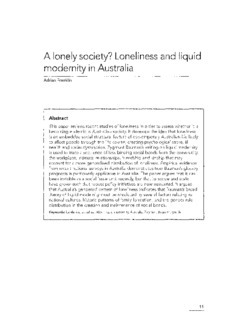 This paper reviews recent studies of loneliness in order to assess whether it is becoming endemic in Australian society. It develops the idea that loneliness is an embedded social structural feature of contemporary Australian life likely to affect people through the life course, creating psychological stress, ill health and social dysfunction. Zygmunt Bauman's writing on liquid modernity is used to trace a sequence of less binding social bonds from the community, the workplace, intimate relationships, friendship and kinship that may account for a more generalised distribution of loneliness. Empirical evidence from recent national surveys in Australia demonstrates how Bauman's gloomy prognosis is particularly applicable in Australia. The paper argues that it has been invisible as a social issue until recently, but that its scope and scale have grown such that robust policy initiatives are now warranted. It argues that Australia's gendered pattern of loneliness indicates that Bauman's broad theory of liquid modernity must be mediated by several factors relating to national cultures, historic patterns of family formation t and the gender role distribution in the creation and maintenance of social bonds.